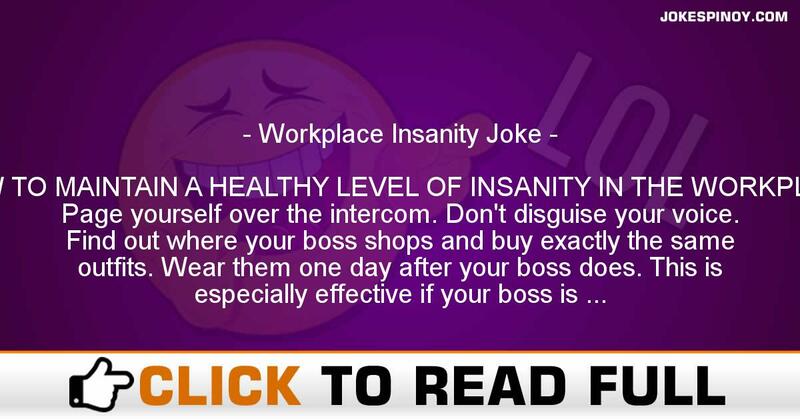 HOW TO MAINTAIN A HEALTHY LEVEL OF INSANITY IN THE WORKPLACE Page yourself over the intercom. Don’t disguise your voice. Find out where your boss shops and buy exactly the same outfits. Wear them one day after your boss does. This is especially effective if your boss is of a different gender than you. Make up nicknames for all your coworkers and refer to them only by these names. “That’s a good point, Sparky.” “No, I’m sorry, but I’m going to have to disagree with you there, Cha-cha.” Send e-mail to the rest of the company telling them exactly what you’re doing. For example: “If anyone needs me, I’ll be in the bathroom.” Hi-Lite your shoes. Tell people you haven’t lost them as much since you did this. While sitting at your desk, soak your fingers in Palmolive liquid. Call everyone Madge. Hang mosquito netting around your cubicle. When you emerge to get coffee or a printout or whatever, slap yourself randomly the whole way. Put a chair facing a printer. Sit there all day and tell people you’re waiting for your document. Every time someone asks you to do something, anything, ask him or her if they want fries with that. Send e-mail back and forth to yourself engaging yourself in an intellectual debate. Forward the mail to a co-worker and ask her to settle the disagreement. Encourage your colleagues to join you in a little synchronized chair-dancing. Put your trash can on your desk. Label it “IN.” Feign an unnatural and hysterical fear of staplers. Send e-mail messages saying there’s free pizza or donuts or cake in the lunchroom. When people drift back to work complaining that they found none, lean back, pat your stomach and say, “Oh you’ve got to be faster than that.” Put decaf in the coffee maker for three weeks. Once everyone has withdrawn from caffeine addiction, switch to espresso. ABOUT US : Laughter is the best medication as the old saying says, we at JokesPinoy.com will provide you with all the funny filipino quotes and pictures in tagalog language. Back in 2013, a group of Filipino OFW (Overseas Filipino Worker) got bored and they try to look for some amusing quotes on the internet simply to have fun but sadly most of the websites they found on that time are having an outdated jokes and have no interaction with the users. From that instant, they subsequently got an idea to build their very own jokes website and let other users to give their jokes or opinion with the existing jokes. Following the funds and concepts gathered, JokesPinoy.com was born, a website that let the user share their jokes and let them have conversation with other users as well. Since the website has been launching, tens of thousands of visitors are coming each day to read jokes and have fun on the website and too as giving their view on the jokes they read. We expect from JokesPinoy.com that this website may provide you some grin and happiness, Life is Short so have fun on it. DISCLAIMER: A number of the jokes, pictures and videos seen in this site are not created by us, they may be made by our users or they just get it someplace in the web just like 9gag, youtube, metacafe, vimio and etc. We regard copyright information which is posted here including funny pictures and humorous videos. If encase there are files posted here in our site which is owned by your and you do not want to share it to anybody afterward fell free to contact us to remove it. Majority of the language used on this particular site was in tagalog and some are bisaya that are both filipino language which originated from Philippines, in case you would like to interpret the joke to english you can used an online translator to translate it from tagalog to english.